Bangkok (VNA) – Prime Minister Nguyen Xuan Phuc on August 18 met with officials of the Vietnamese Embassy in Thailand and the Vietnamese community in Bangkok, during which he lauded the community’s solidarity and mutual support to integrate into local society and contribute to the motherland’s development. 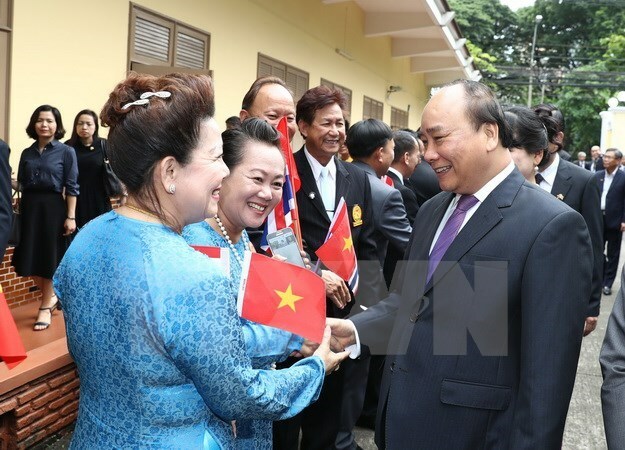 He affirmed that the Party and State always pay close attention to overseas Vietnamese in general and the Vietnamese community in Thailand in particular, while expressing delight at the growth of the community. Regarding the outcomes of his talks and meetings with Thai leaders, the PM said that both sides shared delight at the strong growth of cooperation between the two countries over the past 40 years, especially since the two sides set up a strategic partnership in 2013. PM Phuc said that he asked Thailand to continue creating favourable conditions for the Vietnamese community and issue passports to elderly Vietnamese. Earlier the same day, the Government leader hosted a reception for President of the Thailand-Vietnam Friendship Association Prachuap Chaiyasan. Lauding the practical activities that the association has held over the past years to boost the traditional friendship between the two countries, the PM said Vietnam always attaches much importance to people-to-people diplomacy. He said he hopes the association will continue its efforts to strengthen tourism collaboration between the two countries, while helping connecting investors of both sides. Prachuap Chaiyasan hailed the role of the Vietnamese community in Thailand as an important resource to maintain and develop friendship between the two countries. He pledged to work hard to boost tourism partnership between the two countries and cooperation among localities by making full use of existing transportation routes between both sides. Later on August 18, PM Phuc attended the opening of the Vietnamese Goods Week at the Central Plaza Ladprao trade centre and the signing ceremony of a memorandum of understanding between the Ministry of Industry and Trade and Thailand’s Central Group.